In a world order where globalisation is much christened as blessings for transformation and considered as medicine for fulfillment of human needs across trans-national border,the security and survival of many smaller ethnic groups has reasoned the very viability of much hyped global-isa-tion,in which the identity,language,culture is seemingly threatening to a much sensational level. Language of any particular ethnic group or community,even of a nation,is considered as the chief vehicle of culture. 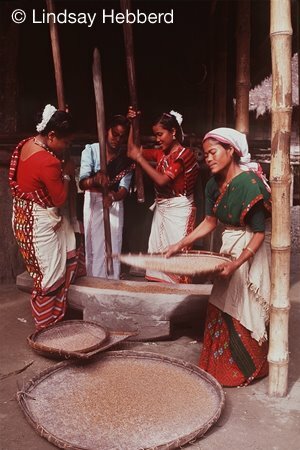 As such,the survival and longevity of any ethnic minority group stands much important when such group do not have their own language script and more often if the language is unrecognized Mishing language,which is major branch of Tani language,spoken widely among the Mishing tribes of Assam and Arunachal Pradesh of NE India is arguably facing immense impediments in term of survivability in its authentic linguistic form and threat of existence if one comes to account the contemporary trends of Mishing language. This Tibeto- Burman speech family of higher Sino-Tibetan ethnology has been witnessing a shocking trends in recent decades. The number of speakers of Mishing language is surprisingly diminishing instead of increasing in terms of population due to affliction from various quarters. While the preponderance of dominant culture over smaller culture in a particular political boundary are upping their head high,at the same time it is a major cause of concern for many ethnic linguist-cultural scholars,experts,researchers and raising consciousness among a few ethnic leaders too. The Mishing language which is branch of Tibeto-Burman speech family of higher Sino-Tibetan ethnology group has another form of missing case. This language has its kinship to Tani groups of people of Arunachal Pradesh which includes Adi,Galo,Nyishi,Apatani,Tagin,Hill Miri,Hrusso languages that are blended with rich oral literature but still remaining in lagging manner. If there is a symmetric approach on the parts of all Tani groups of people,there is much scope to develop a common language as well as higher literature out of combined and co-operative efforts. According to a study,the Mishings while making oral expression in the language,on an average,they use 35% Assamese words,7% English words and 1.5% from Hindi or other languages. This percentage is increasingly steep in case of educated city/town dwellers which is 57%,18% and 3% respectively. The percentage of ethnic Mishing language used among urban dwellers is left with just 22%,which constitute 13% of Mishing's total populace figure stands little more than 78% who use ethnic Mishing language among rural dwellers on an average. Thus the study shows that the urban Mishings mixed up with 85% of other language element in the oral expression. Such trends if continues will leads nowhere the Mishing language,with no scope for further development among increasing urban dwellers. The skills with multi-lingual ability but with lesser command over own mother tongue by middle classes Mishing is a matter of concern. As per 1991 census,out of total 4,67,790 population of Mishings only 3,81,562 persons speak their ethnic language,which clearly indicates that 18% of the populace no longer speak the language. According to 2001 census,the number of persons who returned their mother tongue as Mishing language are 551,224 persons as against the total population of 600,901. (587,310 persons in Assam and 13591persons in Arunachal Pradesh).This mean that there are as many as 49,677 Mishing persons who does not speak their own mother tongue. The decadal growth of speakers between 1991and 2001 is 41.13%.The literacy rate of the Mishing Tani tribe is 60.1%;the male literacy rate stands at 71.4% while the female literacy rate has a dismal 48.3%. The year 1972 is a significant date for the Mishing as well Tani language because it was in this year the leading Mishing literary organisation Mishing Agom Kebang(Mishing Literary Association)came into being with the efforts of Guwahati Mishing Kebang along with the association of a few conscious Mishing individuals. Prof.Tabu Taid,the eminent educationist is a forerunner in the development of Mishing language. During the 17th Silapathar session of Mishing Agom Kebang, Prof.Taid has been given the title''Agom Migang''(Literary Scholar)by the Kebang in recognition to his pioneering contribution towards the growth and development of Mishing language. The Association today has 125 literary units spread across all Mishing inhabited areas. The Mishing intelligentsia,the educated middle and upper classes in some way,seemed to have penchant for preserving and promoting language. These classes are selflessly in their own way as well as in association with Mishing social organization are contributing to the pace of growth by means like donations,sponsorships,publications for the cause of promoting the ethnic language. At same time, the majority of the people who are highly qualified are compounding another threat to the survival of Mishing language from the other ends. There is no denying the fact that most of the children of educated Mishings of today's generation or simply the Gen Y discards speaking the language instead hesitatingly are embracing other developed language while they obtain the Schedule Tribes certificate with pride to get their children into IITs,medical and engineering colleges. There is no bar in learning as many as languages for an individual rather it is benefiting if someone hone skills of number of language. These developments are unwelcome gesture since it is a total loss for the emerging generation where the number of speakers is downsizing cumulatively. The increasing tendency on the part of the parents to make their children learned the dominant language used in their locality is a pure blunder and unexpected attribute from the educated Mishings. The problem is seen more in towns and cities at a much faster rate in compare to tinsel towns and villages as the growing Indian economy is opens up of options for job opportunities in urban areas than the rural counterpart. This same premise is not applicable in case of mixed-speaking Mishing sub-groups such as Bihiyas,Samugurias,Tamar Goyas,Bongkuals since these sub-groups has historical reason behind why they do not speak the language in it's original phonemes and in mixed nature. From this perspective,one can asserts that the more the richer people among Mishings and who move to urban settlements,the more is the level of threat to Mishing language. Is the vertical mobility has been instrumental in making more and more people to accept the language of universal applicability while keeping its own mother tongue endangered?Can we solely blame globalisation for the downward trends?Are these 'threats' on rise due to the emergence and multiple-linkages of globalisation?Are these happening because of one and only 'aggression' of globalisation? The dimensions of this deficiency is all the more striking in case of ethno-linguist minority like Mishings as well as other groups since the present conditional trends is inclining unto disappointing mark. The literary organizations of the Mishings needs more people's involvement who can work harder and dedicate for the cause of the promotion of the language. The other side of the picture is opposite if one strike to reality,the fact that Mishing language is a medium of instruction in most educational institutions of Mishing inhabited areas albeit unrecognized prevalently in lower primary and middle schools,while the subject for learning Mishing is limited to only single textbook up to class IV. There are inadequate teachers and problems of incentives offer by the government especially to the appointed language teachers. Despite the burgeoning clamor for manpower towards the necessity of mother tongue medium textbooks the children has to learned their first lesson in school life in a language that is completely unfamiliar to them. This retards indirectly the growth of human resources if we think in broad sense of the term while the entire nation is in upsurge of scrapping the reservation policy which is constitutionally granted to socially backward classes. This is one such paramount problem where the government look their eye through in conspicuously and dealt with proper planning and steady implementation. The Constitution of India under Article 350-A mentioned that it is the duty state that the children of linguistic minority should be given the opportunity for learning in their own mother tongue at the primary stage. But in practice,there prevails a partial motive behind on the part of the government in clicking to this provision. Under Article 30,minorities are granted the independence to open educational institution with the medium of instruction of their choice provided it is for the preservation and development of their language;the same is impossible to open institution of learning for the backward ethnic groups as the economic problem is stands predominant. The diminishing trends of Mishing language as well as other ethno-linguistic minorities are already compounded by lingering crisis, the future of these languages ahead is bleak unless there prevails a whole-hearted measure from every quarters concerned. It will be meaningless down after a decade or more even someone take initiatives to preserve the ailing languages as the age would dipped into murkier situation marshaled with much problems of neo-identity crisis. I would like to offer my heartiest thanks to Mr. Bhaskar for the article on mishing renaissance.It is really an eyeopener article. I hope that the great mishing people dwelling in all over the world should get inspirations through this article. Because as long as we embrace and love our own mother tongue we had our identity. It is said that lost of culture is lost of identity, thats why i would like to request everyone who considered themselves to be a true mishing, to embrace their own language. Then only we'll be able to protect our identity. I would like to thanks to Migang B.Pegu who is tierlessly working for the great works for the own society.He is a really aro Tani.He feeling for the doing good works for the society.He want to keep footstep on the this world with his valueable work.Society will remember after few years back. Thanking you Pegu kai,so much. B.Pagag JNV,Hawai Anjaw Dist.Arunachal pradesh. Mising people are peaceful tribe of North-East India.They live rapport with agriculture and simple living.They had never ruler since immemorial period.So they have no idea to rule to the their subject.They had got a sweet fruits for the eating and share them but they cannot share equaly to their subject.so Govt.is thrown to sea of their sweet fruit.Now they are no ruler to their subject.They are wanted to do rule self.Govt. is also given to do rule but they are no success do ful filled their dream of subject. PASIGHAT4,oct'2009: Senior Medical officer Dr. Dinesh Bori, 47, passed away yesterday. He is survived by wife and two children. He was suffering from diabetes (Melitus) and had undergone Kidney transplantation in 2007 at Delhi. A graduate from Assam Medical College he served as Medical Officer at Telam, Sille, Changlang and Ruksin PHCs and later, he was posted at Guwahati DRC office. He was awarded with Silver medal by the state government for his outstanding service to mankind. People from different part of the district thronged his native place Sille, East Siang District to pay homage. Meanwhile, the East Siang District Doctors’ Association condole the premature death of Dr. Bori.